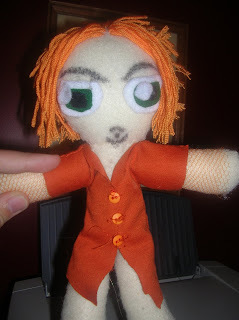 I'm sure you all remember poor pantless plushie Steve Righ, right? Doesn't look too happy, does he? (Gee, I wonder if this is how other pantless plush animals feel?). When Amanda did this drawing the other day I asked her if it was inspired by Steve's disgust in still not having any pants upon his plushie but she just smiled. I tell ya, the kid has procrastination down to an art! Maybe someday soon poor plushie Steve will get some pants but in the meantime it gives Mo the chance to sing "Pantless plushies in a pile" and make me laugh. Hmm, I wonder if Mindless Self Indulgence might be able to make that into a song? ?